In Louisiana, we celebrate everything with a parade. Parading is not just limited to Mardi Gras. Christmas, a Saints Superbowl Victory, LSU National Championship and of course St. Patrick's Day all involve parades with lots of throws and the requisite parties. I live in an area of town that has a great St. Patrick's Day parade. Most of the families host parties and decorate their yard and home for the event. The whole area shuts down for the day and celebrates the Irish way. 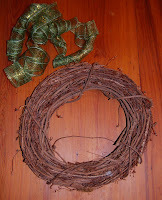 For the occasion, I created a wreath to decorate the front door. 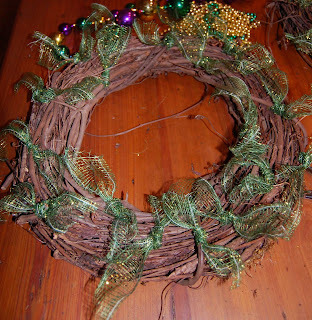 The wreath uses some new sinamay ribbon, but recycles a large Mardi Gras bead to add a bit of sparkle. 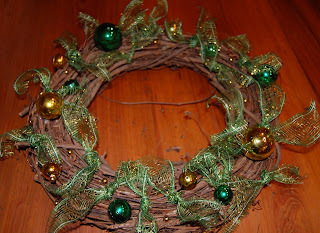 This wreath is similar to the Mardi Gras sinamay garland wreath posted previously. Here are the supplies you will need and some photographs of the steps to put it together. It was simple to create and the options are endless to personalize it your own way. Once the supplies are gathered, unroll the ribbon. Plug in the hot glue gun in to warm up on a protected surface. Cut individual pieces of the ribbon about 6" long. Start tying the ribbon to the wreath form. I recommend adding the first four spacing equally apart. Continue tying the ribbon pieces around the wreath. 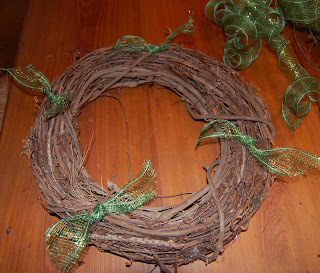 Use the first four ribbons as a guide to help space them evenly along the wreath. You can also use deco mesh ribbon, which is a synthetic version of sinamay. It comes in even more colors, patterns, sizes and finishes and is even more affordable. 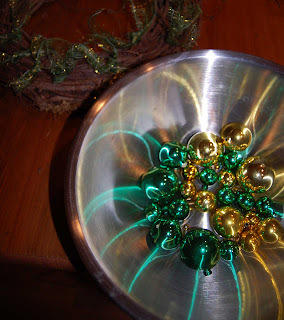 With the Mardi Gras beads over a bowl, use the scissors to cut the string that the balls are strung on. Separate out the green and gold beads. Recycle the purple beads for another project. 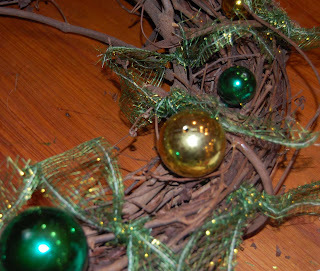 With the hot glue gun, attach these hollow balls to the wreath. Evenly space the assorted sizes and colors around the wreath. The more you add, the more metallic sparkle you add to the wreath. The finished product! Hang it on your door and go enjoy the parade!